Citizens experiment unconventional settings that change their relations with spaces and memories. "Ecrans Urbanis" is an observation of perceptions and reactions bystanders have walking in the city and passing next to an unusual situation. 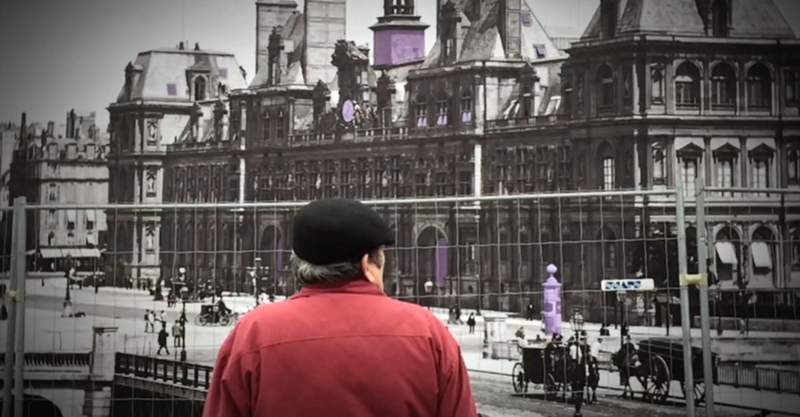 The short film is composed with a sequence of three simple observational movies shot in Paris in 2015, while some gigantic images taken from the Roger-Viollet Collection and representing historical views of the city have been used to cover the temporary structures of a building site near the Hotel de Ville. The clip has been filmed with a mobile phone as a camera, in modest resolution and at 240 frames per seconds, and the result has intentionally some imperfections. Those unconventional "Urban Screens" represent fascinating shots of a century-older urban fabric and give an interesting chance for changing perception of well known places of the city center. Each bystander reacts differently: some of them are intrigued by the images, others just pass by walking straight down or keeping being occupied in their daily actions. Ordinary citizens are turned into protagonists of a consideration about the way we interact with our past and memories.